The SOLX blood collection and storage system has received approval from both the FDA and European authorities. Blood management specialist Haemonetics (NYSE:HAE) will be able to store blood for longer periods of time now that it has completed the acquisition of Hemerus Medical and its SOLX blood collection system. Haemonetics paid $23 million cash at the transaction closing yesterday, and, along with the $1 million it paid earlier in its fiscal 2013 year, has paid Hemerus $24 million to date. The prize in the acquisition would bring a tear even to Dracula's eye as the SOLX system was recently approved by the FDA for eight-hour storage of whole blood. Previously, the collection system received approval from European regulators as the world's first 56-day red blood cell storage system. If the FDA further approves SOLX for 24-hour storage of whole blood prior to processing, Haemonetics will pay Hemerus $3 million more, and depending on sales of SOLX-based products, Hemerus could earn up to an additional $14 million. Haemonetics CEO Brian Concannon said: "The addition of Hemerus' SOLX collection system complements the portfolio of whole blood collection, filtration, and processing product lines we recently acquired. We look forward to bringing this new science for red cell storage to our blood center customers as they seek ways to lower the costs of collecting blood and blood components." The technologies of the blood collection and storage specialist address medical markets of blood and plasma component collection, the surgical suite, and hospital transfusion services. Haemonetics generated $892 million in the 12 months ending March 30. 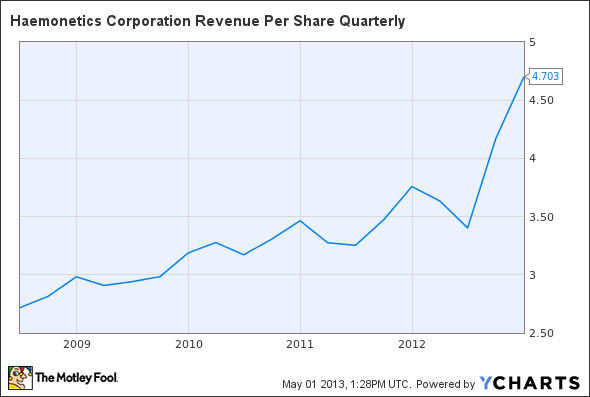 HAE Revenue Per Share Quarterly data by YCharts.